Central Asia is characterized by generally dry climate, dwindling water resources and fragile ecosystems, and is highly vulnerable to changes in precipitation. It is vital to recognize the history of moisture changes in this region and understand its variability and the underlying controls. Using MC-ICP-MS U-series dating and stable isotope analysis, the researchers obtained a stalagmite-based 18O record over the past 10,000 years from Kesang Cave in Xinjiang, western China. 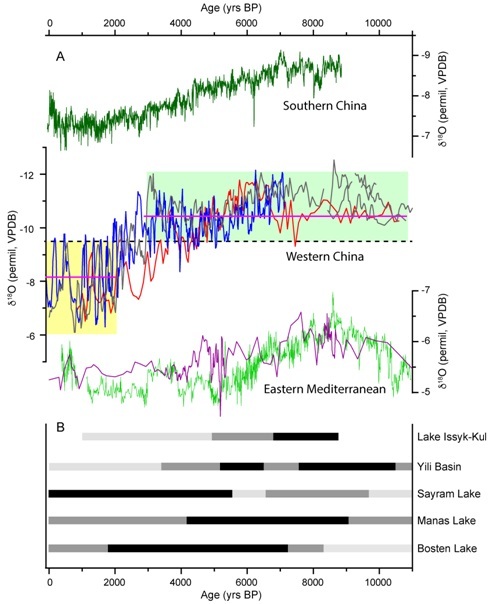 This record reveals that during the early and middle Holocene the climate in western China was relatively wet, and the recycled moisture from the Aral-Caspian basin, the Mediterranean and Black Seas mainly contributed to the precipitation in the study region and dominated the isotope composition of precipitation. It suggests that the dry-wet oscillations in the regions upstream the moisture transports to the western China have prominent impacts on the climate change in Xinjiang, western China during the early and middle Holocene. The researchers also found that the region's climate changed from a relatively humid regime to noticeably drier conditions from 3000 to 2000 years ago, resulting in a shift from astrong moisture composition influence, to a temperature forcing on precipitation isotope composition. They also suggested that the combined effects of decreased precipitation and increased temperature ~500 AD reduced local water availability and likely contributed to the demise of three settlements of Loulan, Niya and Keria at the margin of Tarim Basin, substantiating that the climate changes profoundly affected human society in this area.